The Indian toys market was worth US$ 1.3 Billion in 2017, registering a CAGR of 15.8% during the year 2010-2017. The market is further projected to cross US$ 2.9 Billion by 2023, at a CAGR of 13.9% during 2018-2023. The existence of toys in India dates back to the Indus Valley Civilization around five thousand years ago. The earliest toys included whistles shaped like birds, toy monkeys which could slide down a string and small carts which were made from materials found in nature such as sticks, clay and rocks. In recent years, the advent of advanced technology and machinery has encouraged manufacturers to produce modern and innovative toys. India has one of the largest young population in the world, owing to which, the toy industry in the country has witnessed a rapid growth. The market is brimming with a wide array of both traditional and modern toys. However, with evolving trends, there has been a shift from conventional toys towards innovative and hi-tech electronic toys. For instance, Lego has replaced wooden building blocks while barbie dolls have now taken over traditional cloth dolls. Driven by a huge consumer base, India represents an important market for toys. With a population of around 1.3 Billion, it is the second largest populated country in the world. Morever, the country has a very large young population with around half of the total population under the age of 25. 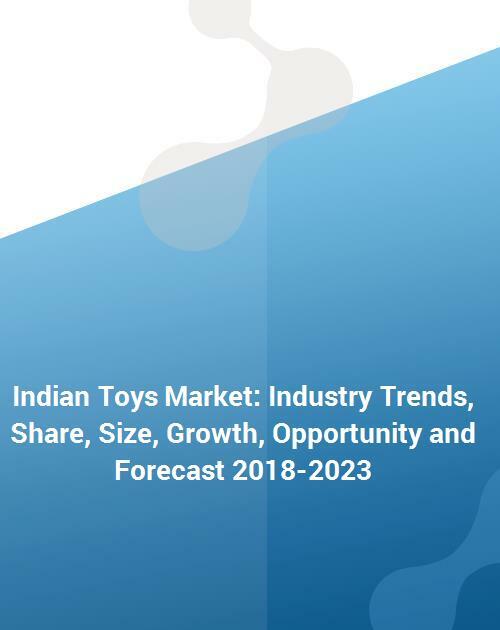 The increasing domestic demand for toys in India is also being catalysed by the country’s strong economic growth and rising disposable incomes. India has exhibited strong GDP growth rates for the last several years and now represents amongst the world’s largest economies. Driven by this trend, the middle-class population has experienced strong growth in the region. consumers have more disposable incomes and their spending patterns have also changed. This has resulted in a major shift from traditional, medium- to low-end battery-operated toys, towards innovative electronic toys, intelligent toys as well as upmarket plush toys. There are a large variety of toys currently available in the market. The diverse product category ranges from traditional plush toys, construction and building toys, dolls, board games and puzzles to high-end electronic toys, educational toys, ride-ons, etc. There are toys which are domestically produced by small, medium and large manufactures and also those that are produced from renowned international brands. Each toy category has inexpensive and high-end versions. Online sales channels have also recently witnessed a boom in India with the evolution of smartphones and other digital media. As quality and features of products can be discussed among shoppers, and prices can be compared on various platforms, online sales channels have appeared to be one of the fastest growing distribution channels for toys in India. On the basis of toy type, plush toys are the most popular segment as they are considered safe and are popular among children of all age groups. Other major toy types include electronic toys, games and puzzles, construction and building toys, dolls, ride-ons, sports and outdoor play toys, infant/pre-school toys and activity toys. Based on gender, unisex toys dominate the Indian toys market, accounting for the majority of the overall market share. Unisex toys are followed by girls’ and boys’ toys. The market has further been segmented on the basis of distribution channel into specialty stores, super and hyper markets, online and others. Currently, specialty stores represent the largest distribution channel. On a geographical front, Maharashtra currently represents the largest market. Maharashtra is followed by Tamil Nadu, Karnataka, Gujarat, Delhi and others. This report provides a deep insight into the Indian toys market covering all its essential aspects. This ranges from macro overview of the market to micro details of the industry performance, recent trends, key market drivers and challenges, SWOT analysis, Porter’s five forces analysis, value chain analysis, etc. This report is a must-read for entrepreneurs, investors, researchers, consultants, business strategists, and all those who have any kind of stake or are planning to foray into the toys market in any manner. How has the Indian toys market performed so far and how will it perform in the coming years? What are the key regions in the Indian toys market? Which are the popular toy types in the Indian toys market? Who are the major end-users in the Indian toys market? What are the major distribution channels in the Indian toys market? What are the various stages in the value chain of the Indian toys market? What are the key driving factors and challenges in the Indian toys market? What is the structure of the Indian toys market and who are the key players? What is the degree of competition in the Indian toys market?